I have to say, my initial impressions are positive. I like the colors, cut and material, and I think they look cute on. I would take a picture wearing the items but that would mean washing my hair and fixing myself up – doesn’t seem like that is going to happen today. Maybe another time. Somebody (Kels from Blonder Side of Life) was wondering about sizing when I posted about this before. I ordered everything in a size Medium (8) and everything seems to fit really well so I would say the sizing is a bit more generous than some running apparel (I’m 5’8, usually wear a Medium or a size 8/10 in street clothes, but in running clothes sometimes have to go with a Large). 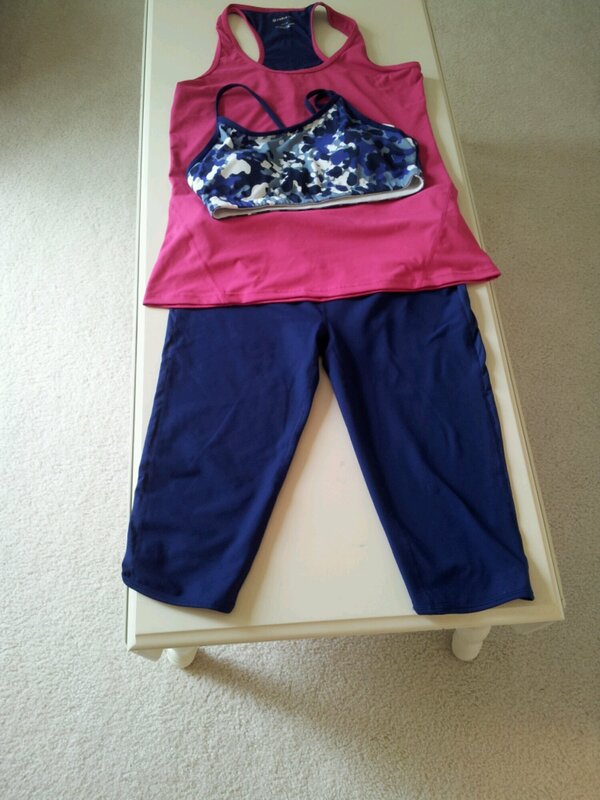 Whatever size you normally wear in street clothes will probably work when ordering Fabletics. I bought a bright pink top with a purple camo bra and purple tights – the purple is a bit on the blueberry side. The colors are very bright and fun in person. I wasn’t sure if the purple pants would be a good idea given the sweat issues we’ve discussed here before, but I’m glad to say that even after I sweated a lot, the pants didn’t show it at all. After I got all sweaty in them, I washed them. The material seems to have softened up some but doesn’t look as if it will pill. The material is matte and kind of soft, looks like it should take a while to wear out. I think the clothes are a great value for the price (I believe I paid about $35 for these three items) and I look forward to wearing them! As always, this review is my personal opinion, I have not been compensated in any way to review or promote this brand.